A step by step guide to creating stunning portraits with graphite. Anyone can create photo-realistic portraits. All you need is to understand a few key concepts and learn a couple of simple techniques. 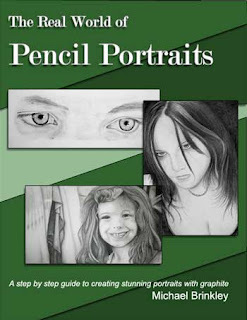 The Real World of Pencil Portraits gives you all of the information you need, including useful tools and techniques. You will learn how the brain works when confronted with art and how to see what you are drawing. The step by step tutorials provide intricate detail so you learn everything you need to create stunning pencil portraits! These are the memories of a child whose eyes see nothing but wonder and excitement. They are not the memories of a worried mother of six who was forced from her home into the icy streets to protect her children from death and starvation. The children's father had been drafted into the war and unwillingly sent to the front lines, leaving the family alone to fend for themselves. In a country ravaged by war, she smuggled her children across the border by Lübeck to escape a hopeless future. She laid her life on the line so that they would live. If it wasn't for her courage they might still be living there today.